Bruce Cass began teaching wine in the Bay Area in 1972. Although Bruce passed away in September 2016, we hope to continue his legacy of engaging wine education. After 40 years of teaching, with an audience of tens of thousands of happy students, Bruce had a vision for a new business which would produce self-guided tours of California’s top wine regions as smart-phone applications. He also planned to produce a print book and an e-book with 3-dimensional maps of prestigious vineyard sites. As always, Bruce wanted his new venture to make exploring wine come alive for his students in a fun, informative, unpretentious environment. Although Bruce did not accomplish his dream of an interactive wine touring smartphone application, we are bringing you his 1-day walking tours and 3-day weekend tours for California appellations for free! Please enjoy these tours, itineraries, maps and recommendations. Familiarize yourself with Bruce’s writings, and follow this blog. Internationally recognized for his expertise on small-volume California wine producers, Bruce earned accolades for his work as a wine educator, editor, freelance writer and wine judge. He traveled extensively doing winery research in Europe, the Pacific Northwest, South Africa, Australia, New Zealand, Chile and Argentina. For nearly 15 years, Bruce taught wine appreciation classes at Stanford University, from which he is a graduate. He also wrote Straight From the Vine, the Stanford Alumni Association Wine Blog. For three years (2005 through 2007) Bruce taught the inaugural wine classes to industry professionals at the Culinary Institute of America in St. Helena, Napa Valley. Bruce was the General Editor of the Oxford Companion to the Wines of North America—winner of Best Reference Book of 2000 by the International Association of Culinary Professionals. Bruce was the Editorial Consultant for Wine Atlas of California—winner of both the Julia Child and the James Beard awards as Best Wine Book of 1993. Bruce contributed to Jancis Robinson’s Oxford Companion to Wine, Hugh Johnson’s Pocket Encyclopedia of Wine, and Hugh’s World Atlas of Wine. A founder of the Society of Wine Educators, Bruce wrote the original Wine Educators Handbook which won several prestigious awards for California’s Wine Institute. Bruce has been a taste-examination qualified judge at the California State Fair Wine Competition twenty times, as well as being selected to judge the Sydney Top 100 Wine Competition in Australia (three times) and the HOFEX Wine Competition in Hong Kong. 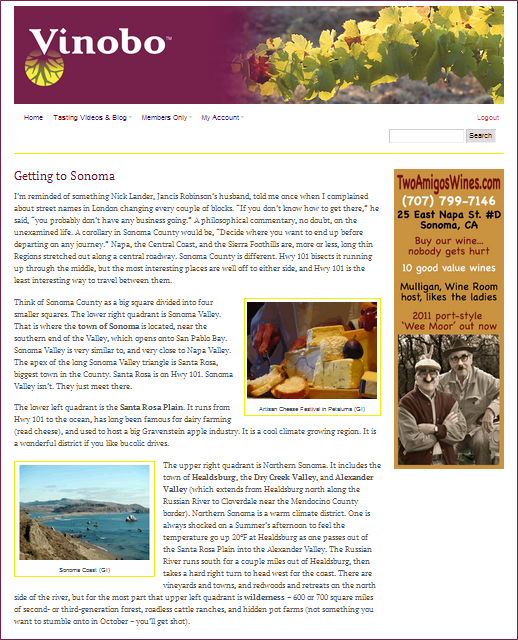 Prior to 2002 Bruce wrote regularly for the Winepros internet site and for Diablo Magazine. He has been published in the San Francisco Chronicle, the Los Angeles Times, Appellation (U.S.), Decanter magazine (Britain), Gourmet Traveler (Australia), Wine (South Africa), and Wine Tidings (Canada). Some of Bruce’s most enjoyable wine experiences were working crush at James Halliday’s Coldstream Hills Winery in the Yarra Valley near Melbourne, Australia (1995), and at L’Avenir Winery in Stellenbosch, South Africa (1996). In spite of Bruce’s amazing accomplishments, he was well-known as a big, lovable teddy bear who generously shared his love of wine, food, music and camaraderie with everyone.